Remember, the guilty pleasure movie, Dirty Dancing? And this famous scene at the end. But that can be a blessing and a curse if you don’t treat that gift the right way. So far, the albums that Clay Aiken has been required to make per label guidelines were like singing with one vocal chord numbed from ..oh I don’t know, dinosaur claws? But this time, this time they gave him the opportunity to do what he wanted. The result? What we knew he could always do. 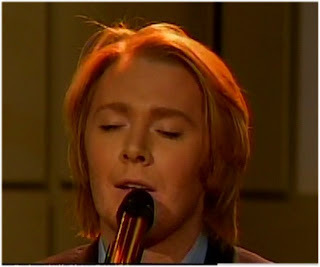 Clay Aiken performed four songs from his new album on live television last night (well,four and a half, thanks to a rude cutaway to a commercial) . The songs were a great mix of a lush ballad, a country crossover song, a jazzy love song. But there was one song that showed the Clay that many of his core fandom knows but that those who only know him as ballad boy or AI Clay haven’t a clue. That song is a nifty bit of green eyed soul, written by Kipper, the album’s producer. Kipper has produced for Sting a few times and it showed in this song. Everything I Don’t Need is everything that I wanted from this album. It’s green eyed soul, it’s growly Clay, it’s got an off-beat funky melody. He couldn’t move around much because the cameras were right in his face but that’s probably good because like too much of a good thing, you need to receive that in small bites. I am not quite sure what the next lines were, I may have blacked out from the blood rushing to my……brain. Amazon.com has longer snippets of each of the album’s tracks here. Jaymes Foster has done an incredible job selecting an eclectic mix. The songs range from the uptempo and shake your thang tunes like Ashes and Falling to Something About Us which Clay describes as the most beautiful love song he’s ever heard. There are cross over potentials in multiple genres. While the album has a definite narrative cohesiveness, the genres are almost sensory overload. He takes you to so many places within the audio sensory map of your brain that even a GPS embedded into your cerebral cortex wouldn’t work. (Especially in Rhode Island, where the streets have no name). Last night when he performed Everything I Don’t Need, I realized that he’s hit his stride as a singer. As good as we thought he was during AI2 or has great as he was in concert tour after concert tour, this is easily the best thing I’ve ever heard him sing.. next to any live performance of Lover All Alone. So you think you know Clay? Have you put him in a corner? I bet you never expected THIS. An epilogue to our “What if Dinosaurs still roamed the earth?” blog. Seems the dinosaur rider has been put out to pasture with one of those “special assignment” titles. Couldn’t have happened to a nicer guy, with a smaller…box. 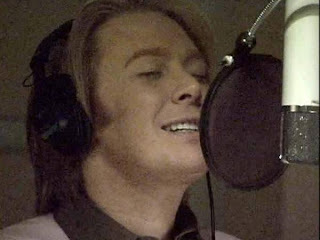 Clay Aiken's new CD, On My Way Here, will be available on May 6th. An album of originals - it's been a long time coming. And the short clips that have been posted on Amazon.com sound amazing, fresh, complex and exciting. It really looks like Clay, executive producer Jaymes Foster and producer Kipper have done a great job! During its six previous seasons, TV juggernaut "American Idol" has launched countless music careers—but the caveat is maintaining staying power. Season-two runner-up Clay Aiken continues to trump the odds. His third RCA album, "On My Way Here," due May 6, follows his 2003 double-platinum debut, "Measure of a Man"; 2004's platinum "Merry Christmas With Love"; and 2006 gold covers album "A Thousand Different Ways." In May, he'll wrap a five-month Broadway stint in the Tony Award-lauded musical comedy "Spamalot." On the new album, his first of original material since "Measure," Aiken worked with Grammy Award-winning producer Kipper (Sting, Chris Botti). The singer talks about the road ahead and his journey to this point. You call "On My Way Here" a thematic reflection on life lessons, a sort of road map of your last five years. What do you hope listeners will take from the collection? When [executive producer] Jaymes Foster and I came across the song "On My Way Here," written by OneRepublic's Ryan Tedder, I really connected to it lyrically. It sums up how the experiences we go through make us who we are. As I'm knocking on the door to 30—and it's knocking hard—this decade has been about figuring out who I am. That set the tone for the album; they're all about things I've learned or universal lessons. Once we had that road map and knew what we were looking for, the songs started falling in our laps. In the past, I'd sing about dog food and sunshine, as long as it was catchy and had a great melody, so it's the first time I've paid close attention to lyrics. I'm not Alicia Keys or Norah Jones when it comes to artistic lyrics, but I like what these songs are saying—and they're still pretty. Knowing that we probably weren't going to get radio made the process even easier, so we just made an album that is me—songs written for me or whose meaning I connected with, and songs that I sing well. "The Real Me" was written by Natalie Grant, who comes from the Christian world but is popular at AC. Her songs tend to explore life's challenges and offer a positive spin. We first looked at that song as one of four originals on the last album. The thing I love so much about "The Real Me" is that when I listened to it, I thought, "It's about God." Jaymes heard a romantic song. Other people think it's about their mom. Everyone is able to take their own message. Natalie was kind enough to change a little bit of the lyric so that it fits my life even better. You've managed to achieve success, as you noted, without a lot of radio support. You have 32,000 friends on MySpace. What vehicles are you looking at to help get the word out, particularly in the digital frontier? The record label surprised me by saying they think this record is radio-friendly. Maybe that came as a result of not trying so hard, but we don't count on it. Look, some people that come from "Idol" are meant for radio—Kelly Clarkson, Carrie Underwood, Daughtry. I think they'd have been successful at some point without the show. I'm a TV star. That's where I came from, so that's where I look to spread the word. I do blog in places and we've got the Web site, but a lot of the digital thing is aimed at teenagers. TV is just as big as digital, and it's always been my best vehicle. Will you tour again to support the record? I haven't had two days off since October, so I'm just not going to worry about a tour right now. This time, we're going to let things sit, see how the album does and put it together when and if it's right. "Spamalot" is pretty silly. Your public persona is not. Why did you choose to make your Broadway debut with this show? And are you funny? That's pretty much the very reason. We had offers from other shows and I'd looked at doing Broadway for years, but I wanted something totally different. I was drawn to this because it was a way to branch out. And [director] Mike Nichols—who is so talented and another reason I wanted to do "Spamalot"—made it pretty clear to me at the start: "Clay is not funny. The script is funny." So I play it pretty dry and it seems to have worked. I've had a great time and worked with a lot of really talented people, who have become my family in New York. You probably knew this was coming: Even though you're onstage at night, have you caught any of this season's "American Idol"? I watched the season with Carrie Underwood, but I haven't seen a lot of the show since. Listen, I am emphatic that I will always be appreciative of "Idol"—it gave me this opportunity, I know that—but I kind of equate it to high school. Just because I went to high school doesn't mean I still go back to watch the team's football games. I've listened over and over to the clips and cannot wait to hear the whole album. It happens to be music I can get really excited. Clay will be appearing on QVC on April 28 at 7 PM and we're playing a little game at the message board, ConCLAYve. If Clay is going to sing 3 songs - what 3 songs do you want to hear him sing? What 3 songs do you expect he will sing? Click on the link and give them a listen. Then post your response in the comments. We'll see who's right on Monday night!